ZUOZ is a collection of atom libraries, organized by application domain and functionality, intended to be used in test case design using the CHUR syntax. ZUOZ atoms have been implemented using Java and Ruby. Zuoz acts like a plugin, enhancing Zug's domain independent architecture, to provide domain specific functionality. All of Zuoz's atom libraries are platform independent. 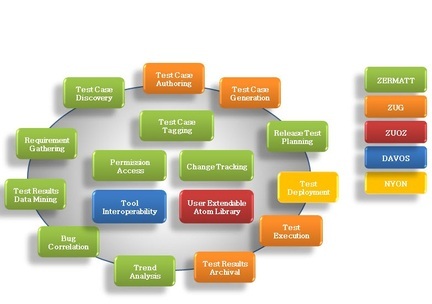 These libraries are organized by application domain areas, and provide building blocks needed to automate test steps. Currently, the atom library for testing Web Applications using Internet Explorer (IE7, IE8), on Windows. Additionally, Zuoz also supports Firefox, Chrome and browserless testing on both Windows, as well as Linux. The library supports domains as diverse as Web-Applications, File Operations, JSON and XML parsing, Mathematical functions, RESTful Web Services, Database Querying and Modifying with SQL, remote commands over SSH, Performance metrics, Email operations. Because of its architectural elegance, it is very simple to add further functionality using the SDK shipped with the Zug product. Our clients have successfully implemented atom packages in C# using .NET technology, to interface to their custom messaging infrastructures.